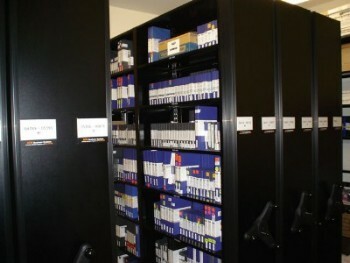 Multi Media or Mixed Media vault storage gives you the ability to store multiple types of media in the same filing system. Some filing systems vary as to what combinations you can store together and others mix and match very well. Each one of our major filing system categories can be custom designed for multi media or may already have configurations for media available. Shelving has long been manufactured for paper records and does a poor job of recognizing the large volumes of multi media needing special attention. 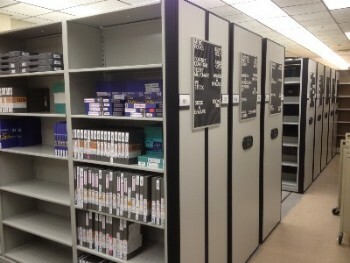 MTM Business Systems offers shelving with specialized depths and dimensions for multi media. We have designed many custom vaults and media centers in the Greater Los Angeles Area and know the special attention your media requires. The picture on the right side of the page is from our Hollywood Vaults project. You can check out the Hollywood Vaults Web site by clicking HERE. Hollywood Vaults is located on 742 Seward Street in Los Angeles CA, 90038. You can reach owner David Wexler at 323-461-6464 for rates to store media at Hollywood Vaults. Hollywood Vaults is a world class secure self storage film, tape and digital media storage facility located in Hollywood, California.